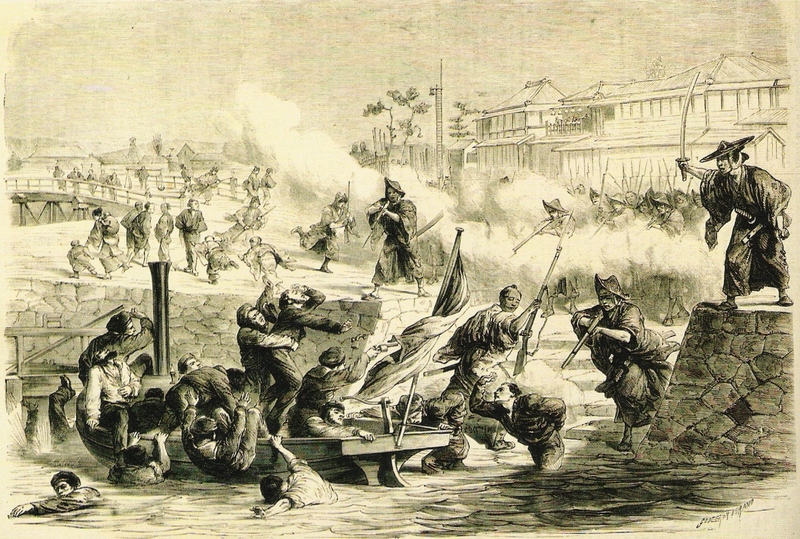 The Sakai Incident, March 8, 1868. 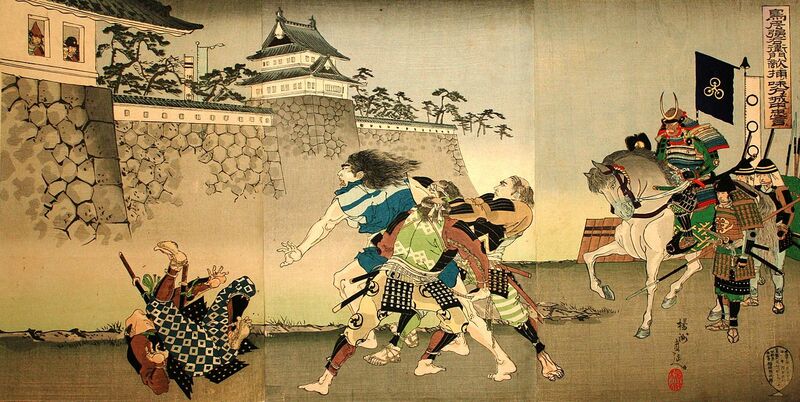 The Sakai Incident has been remembered as one of the three major occurrences of samurai attacking foreigners during 1868. The Kobe Incident, the Sakai Incident and the Parkes Incident. In the Sakai Incident, 11 French sailors from the corvette Dupleix were killed March 8, 1868 in the port of Sakai, Osaka, when they were fired upon by at least 29 Tosa samurai policing the area. At the time, the Port of Sakai was open to foreign vessels. It appears that while an official delegation was being met, around 100 sailors from the ship had come ashore on 20 boats and were sightseeing in the harbor town. Some had become unruly, intruding within shrines and temples, entering people’s homes uninvited, harassing women and frightening the townsfolk. 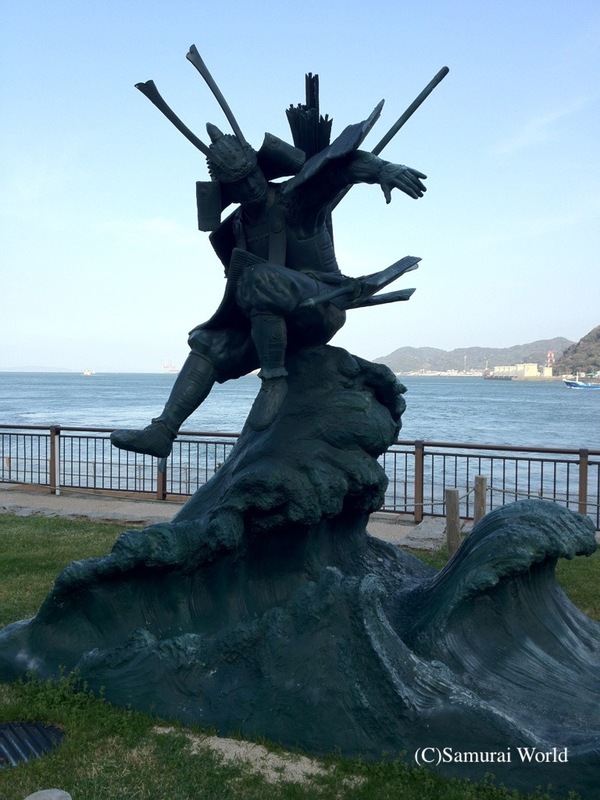 Despite the efforts of the two captains of the Tosa troops, the 6th corps Guard Captain Minoura Inokichi and 8thCorps Guard Captain Nishimura Saheiji, language problems prevented the samurai from quietly and effectively evicting the French sailors. One of the French sailors then stole a regiment banner from the Tosa samurai, a grave insult, and ran. The man was chased, caught, beaten with a staff and the banner reclaimed. 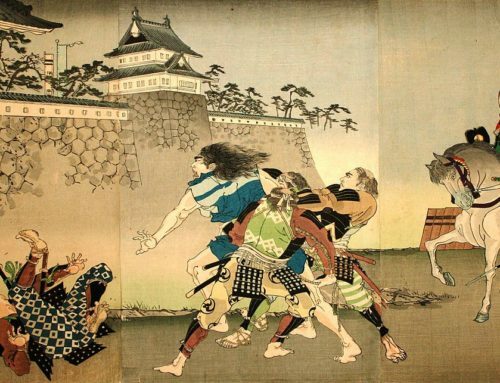 It is reported the French had then shot at the samurai first, and in retaliation, the samurai opened fire on the foreigners, killing nine instantly, while another two died of their wounds the following day. All French crew killed were in their 20s. The incident incensed western nations already dealing with the recently opened Japan, and in solidarity, the French, British, Dutch, Prussian, Italian and American Embassies took a joint stance in closing their doors. Knowing they could not withstand a combined western bombardment by foreign ships, Japan agreed to the indemnities. French authorities had demanded the Japanese reimburse the French for the deaths of their nationals, which was duly paid (the equivalent of 150,000 Piastres). The Tosa samurai were also sentenced to seppuku. 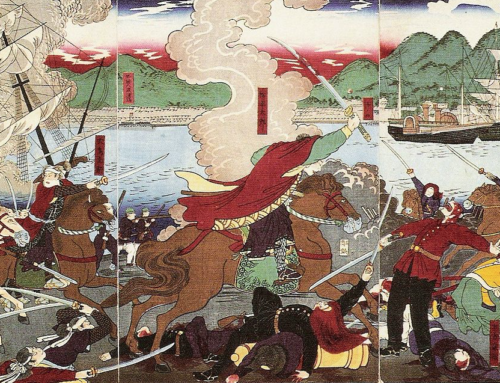 Twenty-nine samurai admitted to firing upon the westerners. Fearing their punishment would incite further anti foreign sentiment, the numbers of men expected to perform seppuku were reduced by way of lottery. 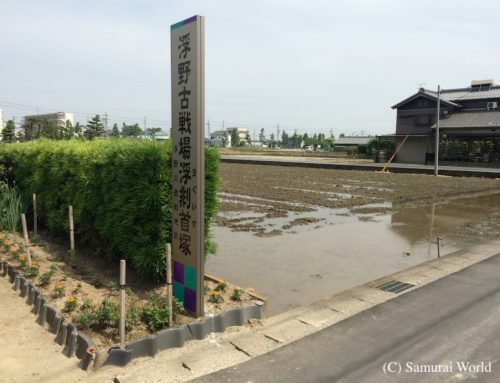 Of the 29 men involved, 20 were selected for seppuku, starting with the two unit captains. The seppuku rites took place late in the afternoon of March 16 in front of the Nichiren sect Myokoku-ji Temple, watched by representatives from both countries. There are stories that some of the condemned men flung their spilled sliced intestines towards the foreign witnesses in contempt. Having witnessed 11 of the Tosa samurai bravely cut themselves open, the commander of the Dupleix, Captain du Petit-Thouars, considering the reparation sufficient, requested the executions be ended, and so nine more were pardoned, although banished to Kumamoto and Hiroshima for their actions. Because of the Myokoku-ji’s status as an Imperial temple, the remains of the men who performed seppuku are buried in the nearby Hoju-in Temple. The Myokoku-ji has a monument to the samurai on the spot where the acts of seppuku took place, and also retains the tanto blade used by the men to slice open their stomachs, and the still blood spattered sambo table on which the blade was placed. 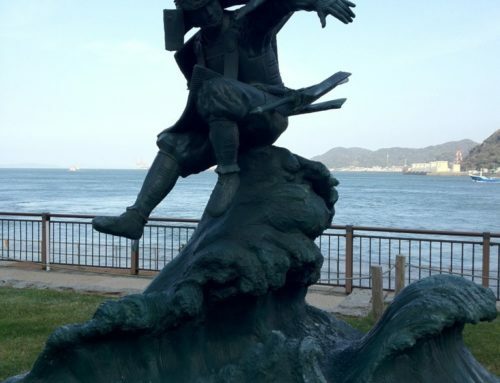 A monument to those French crew slain in the original incident stands in Kobe City.